← It Could Be You…! Everything is upside down in Canada – traffic on the wrong side of the road, taps opening up and down, and lights switching on downwards instead of up. The air is slightly opaque, heavy with atmosphere, and a hazy sun penetrates through. And the mosquitoes sure can bite hard, as soon as dusk descends. I go for a two-hour hike with a Guelph walking group. Everywhere is parched – unusually so, they say. No car washing is allowed or watering of lawns and driveways. We walk along the banks of the Speed River, passing quaint board houses with brown lawns open to the roads. The newer ones are made of wooden framework with brick veneer. The streets are clean and well kept, spacious and wide, reminiscent of Australia and Zimbabwe. In my mind’s eye, I see Kenya’s craggy potholes and steep cutting road edges, decorated with warning pieces of plastic bag and debris, and cannot help comparing. But the gardens are scraggy, unkempt and dull. A few days into my visit, my hosts treat me to Canada’s wonder of the world. “Tacky” is what Grant calls Niagara Falls with its flashy signs and noise. The falls are dwarfed by the commercialism around them. Beautifully manicured lawns and gardens with paved walkways are smothered with people, many wearing bright blue plastic rain-covers handed out to “Maid in the Mist” trippers. I spy tiny boats thickly lined with blue- and yellow-clad midgets plying the foamy waters between the two falls far below – but you have to be quick to grab a gap in the the surge of bodies leaning over the rails. We experience the misty fall-out from Horseshoe Falls, marvelling at being so close to the thunderous spectacle. We are well herded: no long queues. Just a surge on board and then off again, guided efficiently, but in bored fashion by youths on holiday jobs. A sedate drive in the dusk beside the river, through a quiet parkway lined with luxurious mansions of varied architecture, leads us to the rich area. Niagara-on-the-Lake hosts an excellent production of Shaw’s “The Millionairess.” Laura and I covertly rush to the washroom to change into presentable dresses for the occasion. We needn’t have, as there are as many gradations of dress code as there are people, but we feel better. There are queues with a vengeance for the CN Tower in Toronto; one hour, then forty minutes, then several thirty minute sessions as Laura and I spell each other, progressing slowly up via steps and lifts. 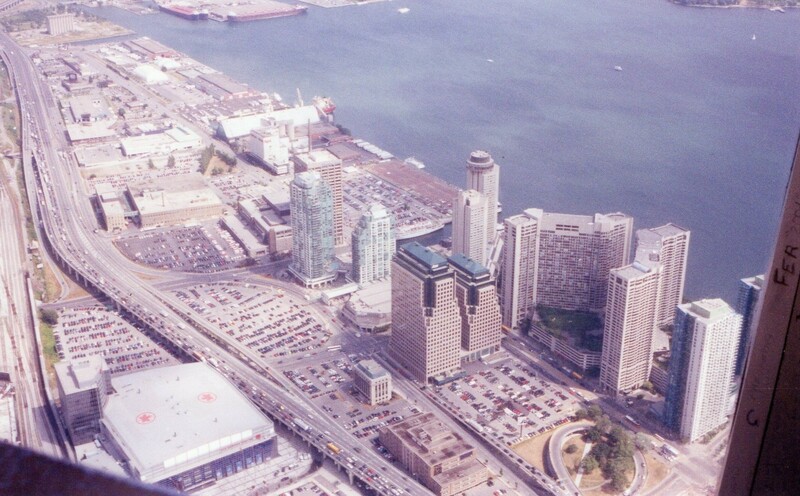 But the day is bright, and from the windy Pod, we see Toronto with its islanded waterfront stretch out in a semi-circular concrete carpet far below. This is an indoor city. The streets are empty of people, but there are thousands of parked cars. Enormous arterial highways, up to sixteen lanes wide, hum with lines of slowly progressing vehicles, a good half of them behemoths pounding the tarmac and vibrating the air. Kevin is a masterful chauffeur and most companionable guide round two museums. He makes no secret of the fact that he revels in the opportunity of getting out, rather than sticking at home spending his vacation mending jumps, cutting grass, and tinkering with machinery. I feel guilty for depriving Laura and Grant of their home help. We lunch in a top-floor restaurant. My eyes light up when I see the menu. Avocados … but in this concrete jungle? Where do they pick them from? “Are they fresh?” I ask, my mind’s eye picturing green mush pressed into a tiny can, wondering if it will turn black after opening. Nevertheless I try the succulent smoked trout with avocado; it is quite delicious. But I have offended the management. We take a quick stroll through Yorkdale Shopping Centre, where I dance a rapid two-step with a well-dressed individual, intent on getting near me. I notice his pal keeping cave by the wall. He’s met his match this time, though: my targeted backpack remains intact. Then I discover the front zip of my bum-bag is open. But nothing is missing; I must be more careful in future. On the way to Collingwood we pass through rolling farmland: crops of corn and beans, a few cattle, some sheep, the odd horse grazing in a paddock; farmhouses atop hills, and vast forests. Roads carve straight lines of latitude across the countryside, but we have to “tack” like sailing boats to get to our target in the north. We watch local Olympian Jay Hayes come third in a Grand Prix show-jumping event. Kids drive buggies along watered sandy paths; spacious, busy exercise arenas; acres of stalls for the horses, all temporary, smart and safe; nothing at all like the makeshift country-style horse shows in Kenya. But I see some riders infinitely worse than those at home. That evening, I settle down to watch Jennifer Capriati and Serena Williams in the final of the Canadian Open Tennis on TV. In Mennonite country a pacer rolls with camel-like gait, pulling a buggy through the only covered bridge left in Canada. We pass another horse and buggy on the main road – trotting conventionally this time – driven by round-faced ladies clothed in long black skirts and stiff black bonnets. 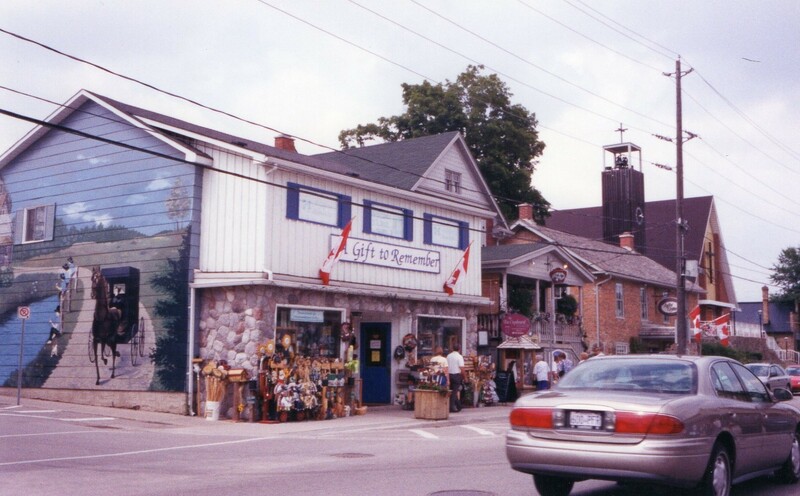 St. Jacobs is a quaint tourist town with shops spiralling upward inside a disused silo. The Mennonites are renowned for their exquisite patchwork, and I cannot resist a token, which conveniently drains my purse of all but a handful of Canadian pence. It is time to board the plane to Washington. 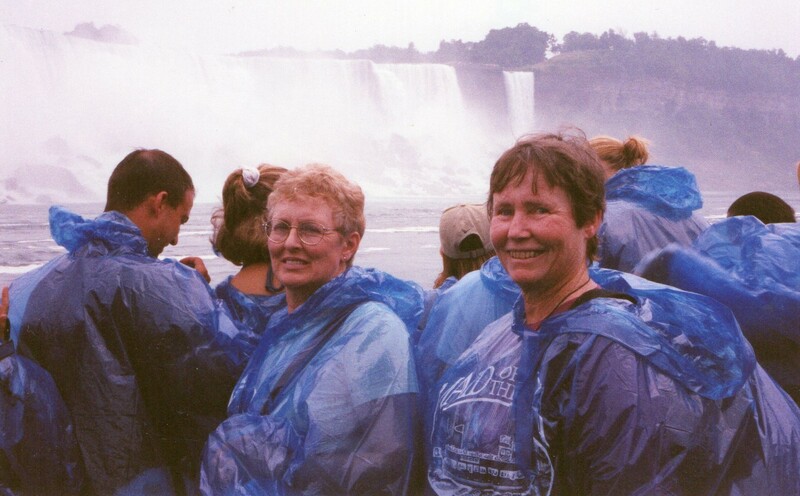 This entry was posted in Travels and tagged Australia, Canadian Open Tennis, Kenya, Mennonites, Niagara Falls, show-jumping, Toronto, Zimbabwe. Bookmark the permalink. Glad to see you enjoyed your time in my corner of the world, Jane. You must have come in August of a drought year – last year everything stayed green right through the summer. Next time, come in October and take in the Fall colours. hello Glen – When I was there – the fall colours were just beginning…. and my hosts said I should’ve come a month later too! Enjoyed this immensely Jane. I’ve never been to that part of Canada and it was a treat to see it through your eyes. I always imagined Toronto to be an indoor city, except perhaps during its’ brief summer. Re your ‘upside down’ observation; I was going to say that you’d better not come to Australia then because you’ll certainly find our light switches upside down to you! But then I realised you’d already been here. At least we drive on the sensible side of the road! Look forward to more of your travels. Thanks so much for your feedback! I havent noticed the switches so much in my recent visits to Australia – perhaps because I’m getting used to them.